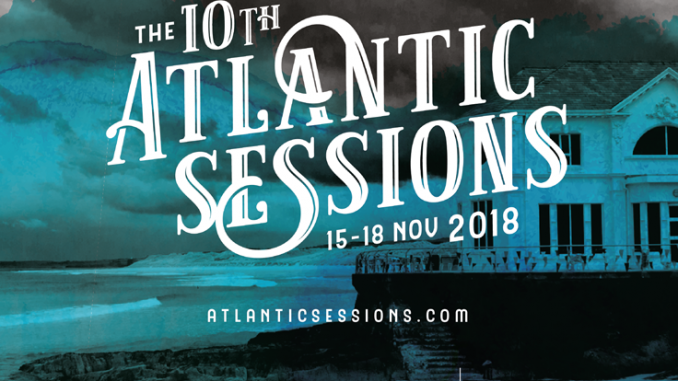 From 15 – 18 November, over 110 musicians will descend on Portstewart and Portrush in celebration of the 10th Anniversary of Atlantic Sessions. 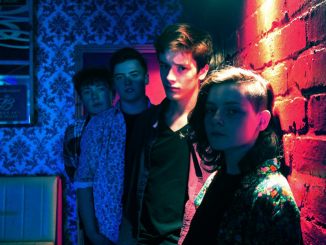 Over 40 music trail gigs are free of charge. Tickets for headline events and accommodation offers are available from atlanticsessions.com. We hope to see you there! In just under two weeks, over 110 musicians will descend on Portstewart and Portrush in celebration of the 10th Anniversary of the award-winning Atlantic Sessions Music Festival. From 15 – 18 November, live music from Northern Ireland’s finest artists will take place in restaurants, hotels, pubs, coffee shops and music venues, with each musician plays their own music for one hour forming a music trail across the two resorts. The Causeway Coast and Glens Council event have over 40 music trail gigs which are completely free of charge and no booking is required. The music trail of free gigs will feature artists such as Adam Grant, Amanda St John, Ard Ri, Eamon McNamee, Edelle McMahon, Gemma Bradley, Emer Maguire, Hunkpapa, Lauren Bird, Lonesome George, Michael Kerr, Nathan O’Regan, Paddy Nash, Paul Casey, Phil D’alton, Brigid O’Neill, Runabay, Sam Wickens Band, The Wood Burning Savages, Toni Whitten, Ursula Burns, Rory Nellis and Waldorf & Cannon. 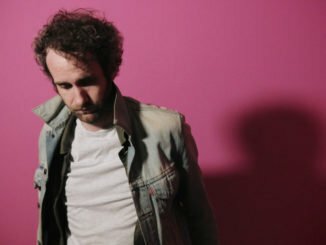 Newcomers to Atlantic Sessions this year include Pale Lanterns, Rebekah Fitch, Conor Mason, Dimpker Brothers, Drew Hamill Band, John Tracey, Jordan Farndell, Lucy Bell and Michael Cunningham. 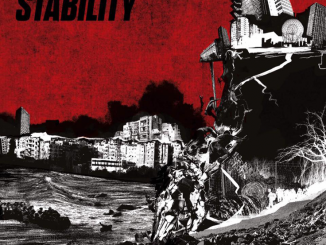 Many will be premiering work and launching new singles, EP and albums at the festival. Programming of the festival is by Snow Water and in celebration of the 10th anniversary, they have invited guests Radio 1’s Phil Taggart, Third Bar and Gary Lightbody, Joe Lindsay and Ralph McLean, to curate headline events. Showcase artists throughout the festival include All Tvvins, Anthony Toner, Arborist, Arco String Quartet, Brand New Friend, Ciara O’Neill, Bronagh Gallagher, David C Clements, Junior Johnston, Kitt Philippa, Gerry Norman, Malojian, Matt McGinn, Neil Martin, Rosborough, Son of the Hound, Strange New Places and Susie Blue. This year also sees for the first time the introduction of special accommodation offers for visitors throughout the festival, a new partnership with Translink, and a closer partnership with Bushmills who will be providing drinks promotions throughout the four days. Atlantic Sessions coincides with the Causeway Coast and Glens foodie event ‘Taste Causeway’ featuring theme nights, speciality menus and food tours which showcase the impressive repertoire of local produce. Tourism Ireland is promoting the event internationally to showcase the Causeway Coast as a tourism destination, and media from across Europe and the States will be attending for the first time. 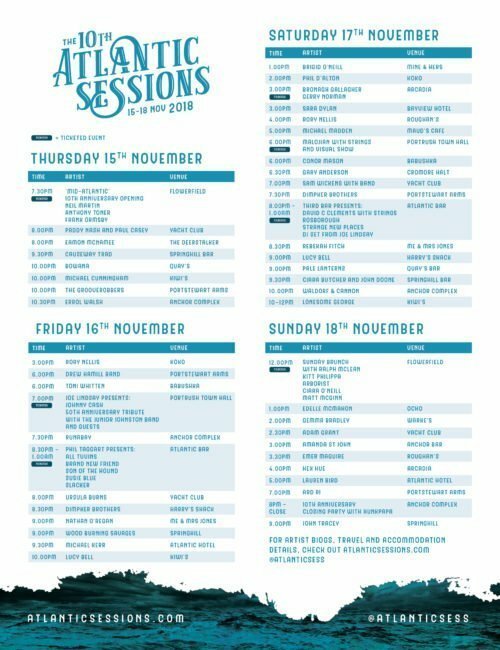 For the very latest news, including tickets, accommodation and line-up information, go to www.atlanticsessions.com or follow us on Facebook and Twitter @atlanticsess.